Can a Modified Sine Wave Inverter Damage Electronics? If you enjoy camping, having a pure sine wave inverter for your camper is quite useful so you can run your electronics while you are in the wild. Modified sine wave inverters can be found at a great price, but there is always the potential for damage to your electronic devices — which makes it necessary to learn as much as possible before you make your purchase. There are only two types of electronics that you need to be concerned about when using a modified sine wave inverter: appliances that use AC motors and certain classes of delicate medical equipment. If your electronics don’t fall into either of those two categories, then it's extremely unlikely that a modified sine wave inverter will do any damage. While a pure sine wave inverter is safe for use with a wider range of devices, the greater cost associated with pure sine wave inverters isn't always worth it. Both pure and modified sine wave inverters take 12V DC from a battery and turn it into something that approximates the AC power normally available from the wall outlets in your home or business. AC stands for alternating current, which refers to the fact that AC power periodically changes direction. This can be visualized as a sine wave that gently rises and falls and swaps polarity instantly when it hits zero volts. In pure sine wave inverters, the AC power produced by the inverter very closely matches an actual sine wave. In modified sine wave inverters, the polarity abruptly switches from positive to negative. The simplest inverters produce a square wave, where the polarity is flipped back and forth, while other modified sine wave inverters create a series of steps that more closely approximate an actual sine wave. Since producing a modified sine wave is a much simpler process than creating a pure sine wave, modified sine wave inverters are typically much less expensive. The trade-off is that some electronics just don't work correctly or may even be damaged if they aren't powered by a pure sine wave. 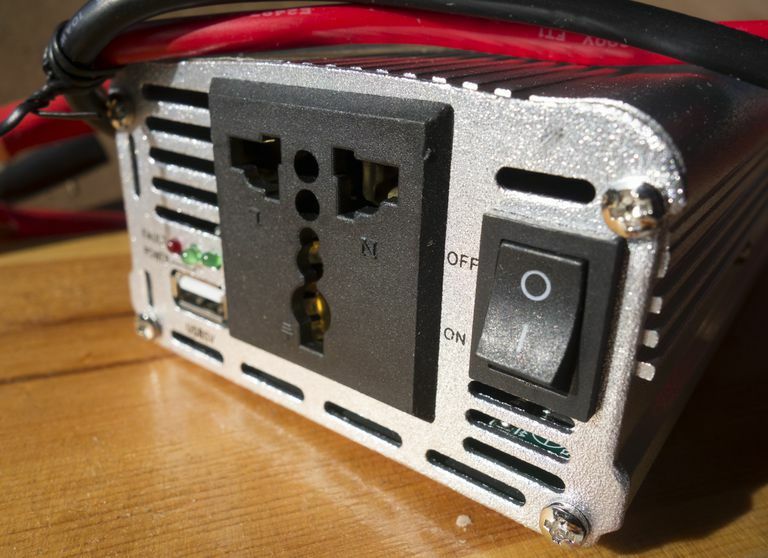 While you’re probably fine using an inexpensively modified sine wave inverter in your camper, there are a few different things that you don’t want to run off a modified sine wave. Anything that uses an AC motor isn’t going to work to full capacity on a modified sine wave. Appliances like refrigerators, microwaves, and compressors that use AC motors won’t run as efficiently on a modified sine wave as they would on a pure sine wave. In some cases, running an AC motor on a modified sine wave may lead to a buildup of excess waste heat that could damage the equipment. You’re probably OK to use these devices with a modified sine wave inverter, but you do so at your own risk. The other main thing to be concerned about with modified sine wave inverters is delicate medical equipment. For instance, if you use a CPAP to help correct apneas when you’re asleep, you’re going to be better off with a pure sine wave inverter. Some CPAP manufacturers warn that you can damage your machine with a modified sine wave inverter, and others specify that the CPAP will work but the humidifier unit could be damaged. Other types of medical equipment, such as oxygen concentrators, also need a pure sine wave. In these types of cases, you’re better off using pure sine wave power or looking for a unit that can be powered by DC without the need for an inverter at all if it's available. Some devices suffer from unwanted interference from a modified sine wave inverter. You can power a radio with a modified sine wave inverter, but it may pick up interference from the modified sine wave, which could make it difficult to listen to. The list of electronics that usually work just fine with a modified sine wave is far too long to get into here. Suffice it to say that if it doesn’t use an AC motor, isn’t a delicate piece of medical equipment, and doesn't fit into any of the other no-go scenarios, you’re probably going to be in the clear. If the device that you want to power uses a rectifier to change the AC into DC, it’s extremely unlikely that you’ll have any issues. That means your laptop is probably going to be fine, although some manufacturers claim that not using a pure sine wave inverter will shorten the operational lifespan of the laptop power brick. If the device you want to power up runs on DC power in the first place, like a laptop, you're actually better off looking for a way to skip the transition from DC to AC and back to DC. If that seems complicated, it may be easier to think of it in terms of your cell phone. When you charge your phone in your car, you don't wire in an inverter and plug in your wall charger. You plug directly into your car's cigarette lighter socket, which is both easier and more efficient. Laptops and many other devices can also be powered directly from a DC power source in exactly this same way with the right adapter.